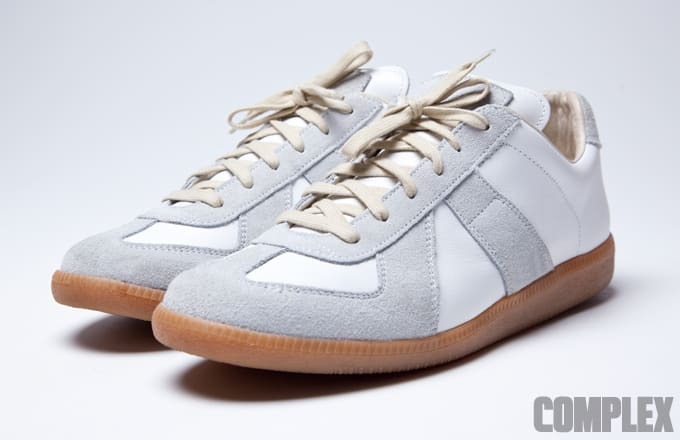 Maison Margiela's versions are made from a 100% calf leather upper with gray suede details on the toebox, around the eyelets, heel, tongue label, and side stripe. The sole is pretty substantial and they're really comfortable to get on. The big difference is the slightly padded tongue with a hidden elastic strap underneath, which ensures a snug fit and gives you the option to wear them laceless as a slip-on. Japanese designer Chitose Abe recently revisited this concept for her Air Max 90 Sacai x Nike collaboration.